If you're ready to submit your order now, click here to be redirected to the CONTACT page to fill out the form. If you have not yet ordered on our new website with the new process, please read the information below. Then, follow the prompts on the CONTACT form and click SUBMIT when you're done. No payment will be collected during this first step. You will receive an invoice with your order details and total via email within 24 hours of your submission with a link to pay securely by credit card via PayPal. A PayPal account is not required. Prices are listed within each item's description. Click on the post of your favorite design for all the details. Payment is required to begin processing your order. Items will be shipped to the address you provide on the order form within 3-5 business days of payment. Orders that are not paid within 10 days of the invoice will be cancelled. If your order is cancelled and you change your mind, please email Jen at cutepetgear@gmail.com with your invoice number and the order will be reinstated. Most orders shipping to the United States will ship for a flat fee of $3.00. If you order a large quantity of items that significantly increases the weight of the package, additional charges may apply. Your shipping charges will be clearly identified on your invoice. If you have any questions about shipping before you submit your order (or if you are shipping to an address outside of the US), please use the CONTACT form. PayPal is one of the most secure ways to submit your payment online because your information is encrypted. Even the seller does not see your credit card information! When you receive your invoice via email, click on the VIEW AND PAY INVOICE button. If you have a PayPal account, enter your information in the appropriate fields. 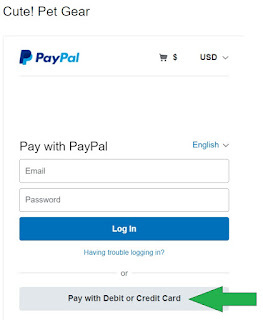 If you do not have a PayPal account, click on PAY WITH DEBIT OR CREDIT CARD (see picture below) and follow the prompts to complete your payment. When you're ready to submit your order, click here. If you have any questions, email Jen at cutepetgear@gmail.com. Please allow up to 24 hours to receive a response. If you have Rewards Points from our old website, no worries - we've kept the records! Though our new site does not have the rewards feature, we're honoring any points you've previously earned. Just add a note in the comments when you order that you'd like to use your available points on your purchase and we'll factor in the discount.